Our LED screen created a buzz at the South West Business Expo, positioned high above the exhibition stalls. The screen showed adverts from the sponsors and partners along with information to all delegates about the show. With around 2000 delegates and 300 stands, the Expo proved a lively forum for networking. 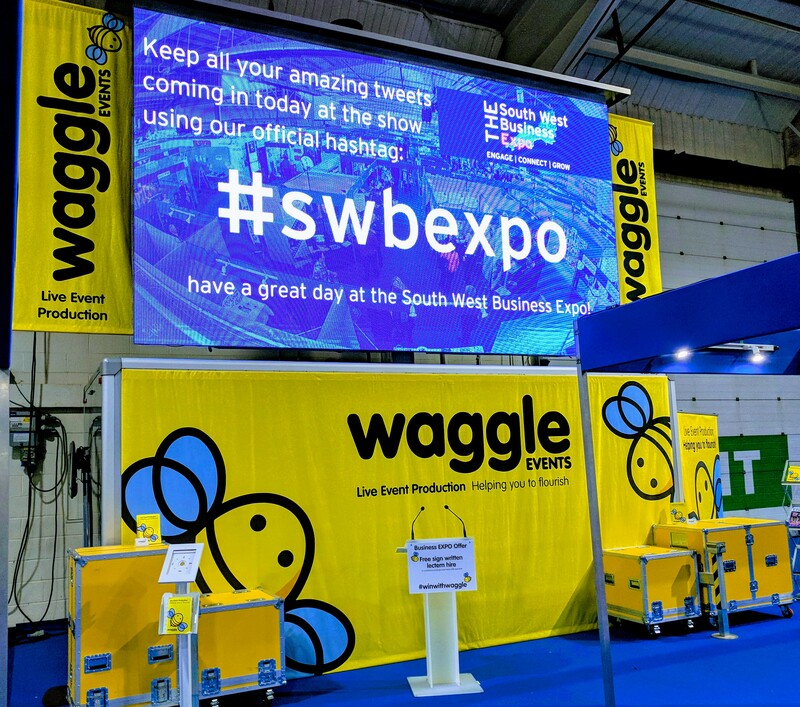 The LED screen was a draw for Waggle Events, bringing lots of delegates from training organisations, venues and charity fundraisers. The 5m LED screen is particularly useful for outdoor events where a scattered audience can be entertained and informed without the constant need for tannoy announcements. We have used it for great effect at events like the Commando Challenge, which is a major outdoor event raising funds for Devon Air Ambulance and the Royal Marine Charity. We used teams of volunteers to film participants tackling the muddy challenges across the 10k course which we then streamed on the LED screen back at the Village, to the amusement of the audience waiting for friends and family to complete the course. The screen is also very useful at conferences and exhibitions as it is visible above a crowded areas, distributing information and engaging the audience with interviews, activities and updates. More information about our LED screen and audio visual packages can be found here.